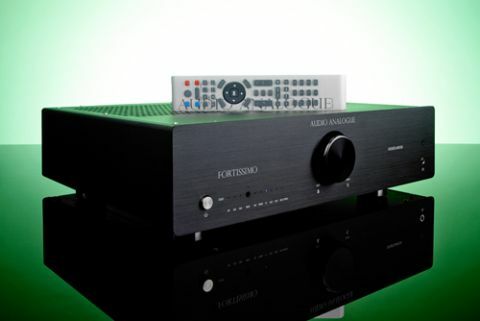 Audio Analogue Fortissimo review | What Hi-Fi? The Audio Analogue Fortissimo is clearly out to impress. It’s been a while since we tested an Audio Analogue amp, and the last one we had – the Audio Analogue Crescendo – didn’t exactly blow us away. Will the Fortissimo be any different? Let’s tuck in. We start it up with a satisfyingly clunky power button. This amp needs a good hour to warm up – not too hot, though – so we spend a little time exploring its shell. It feels about right for a £1500 amp: sturdy and weighty. Right in the middle is a knob that doubles as a button. Twist it and a bunch of LEDs light up (far too brightly) to denote the volume level; press it to switch inputs. This is the Fortissimo’s first hiccup: the dial spins with little resistance and feels a bit loose. At the back are the usual analogue inputs (line-level and balanced) and a set of digital ones. There’s also a built-in DAC. More on that later. The remote control is a mixed bag. We like the metal face and the big, responsive keys. We also like the motion sensor, which makes everything light up whenever the remote is moved. The button layout is a bit cluttered, however, and we’re not keen on the way the large-print AUDIO ANALOGUE peers at us from between the buttons. Suitably warmed up, the first thing we notice is the size of the sound. It’s a wide-open soundstage, spacious and organised enough to make sense of the Buena Vista Social Club. It’s also an agile performer: there’s good level of precision to the proceedings, and individual notes are described with detail. Dynamic reach is decent at the low end – not so much from the midrange to treble, but it’s a sweet sound nonetheless. It also gets plenty loud with ease. With 100W per channel, this amp certainly had no trouble with power. ‘Fortissimo’ is about right. For all that this amp does right, though, it isn’t a very interesting sound. The Fortissimo struggles to really convey the musical impact of dynamic contrast. We’d like more rhythmic precision: as it is, the Fortissimo doesn’t make much of the interplay of instruments performing at the same time. Put on David Bowie’s The Stars (Are Out Tonight) and the lead guitar never feels like it’s weaving between the drums and vocals. Ziggy Stardust’s energetic comeback never really has a sense of drive or momentum. We switch from rock to disco to booming orchestral soundtracks. Nothing we did seemed to affect the Fortissimo’s unexciting presentation. It just plods on, doing the job but with little joy or vigour to keep our attention from wandering. Switching to headphones doesn’t make the amp any better. It’s the same lack of drive, but more unbalanced, tipping away from a weak low-end towards a prominent treble. The result is a lack of weight that crosses the line from crisp to harsh. We don’t recommend listening to this amp through headphones. One thing the Fortissimo can boast about is its wealth of connections. The built-in DAC means you get USB and coaxial sockets alongside the usual analogue offerings. And we’re pleased to say that the DAC is rather good. It makes up for some of the amp’s shortcomings, allowing a greater sense of energy to come through, and ultimately delivering a more engaging performance. The Fortissimo also has a built-in phono stage, which caters for moving magnet and moving coil cartridges. To switch between the two, however, you’ll have to unscrew the lid of the amp and make the switch directly on the amp’s circuit board. You can also change cartridge loading, although that choice is limited. The phono stage is decent, but exhibits a distinct lack of transparency. The level of clarity was higher in moving-coil mode than with moving-magnet, but there isn’t much in it – the Fortissimo doesn’t show off the jump between our £1000 Rega RP6 and our reference £12,900 Clearaudio Innovation Wood package, for instance. The Audio Analogue Fortissimo is not an unpleasant stereo amp. It does enough things right, like including a rather good DAC, to make us warm to it. But in the company of similarly priced greats like the Rega Elicit-R and the Roksan Caspian M2, it fails to truly impress.